Let's dive into the coating process to learn more about how to place an order and what to expect during your coating experience. To get the most out of our coatings and improve your products and processes to the fullest, get our e-book. 1. Request a quote and provide drawings or photos as necessary. Our team will respond within one business day (usually within the hour) and ask for any additional information needed to issue an accurate quote. We'll also give you shipping instructions along with an RA# for shipping your parts to our coating facility. 2. Receipt, review and order acknowledgment. Once received, your parts are inspected to ensure we got everything you sent. 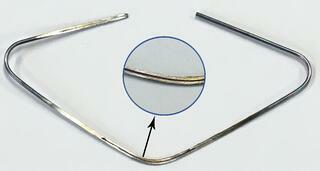 We also photograph the parts for verification and traceability. If there are any questions or "red flags" before coating, our Customer Advocate will contact you to review your order and any potential concerns with processing. Substrates listed on our material compatibility chart as "not treatable" will either be returned directly to you or along with your compatible parts after coating. Once everything is confirmed, our customer service team sends you an order acknowledgment email with delivery date. Note: SilcoTek takes special care to collaborate with all our customers and provide exceptional service that exceeds your expectations. Our manufacturing system employs FIFO (first in, first out) and One-Piece-Flow methods for moving parts through. The data show that these techniques are best for both speed and efficiency as well as minimizing potential handling damage or errors. While our ultimate goal is to reduce S.T.A.G. (ship time average goal) as much as possible, parts occasionally need to be re-worked to ensure the coating meets our specifications and high expectations for quality. For this reason, SilcoTek currently does not offer a formal expedite program. Rest assured we understand the urgency of your parts and will do everything we can to coat them quickly and with the top-notch quality you've come to expect from us. Have questions? Go to our Frequently Asked Questions page for quick and concise answers about our coatings. 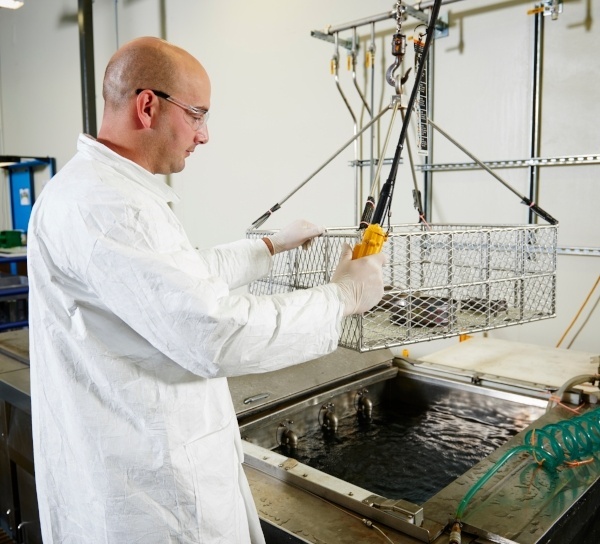 SilcoTek uses proprietary surface preparation methods in order to ensure the best coating possible. It is important to know that any surface imperfections like scratches, rough surfaces, or widely varying surface characteristics, will be highlighted by the coating process, not hidden. After a thorough surface preparation, our technicians load customer parts into a vacuum vessel corresponding to the size of the parts. This vessel is placed in a large oven and connected to the raw material - gas - then heats to temperatures near 400° C. Throughout this process, a proprietary blend of gas enters the vessel and starts a reaction which diffuses the treatment into the molecular lattice of the substrate, forming the ultra-thin SilcoTek coating that so many have come to recognize and trust. 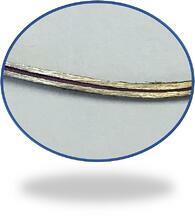 To illustrate this, we coated a 1/16" OD, .4mm ID tube with multiple bends both internally and externally. After coating, the tube was cut open to examine the coating at the center-most point inside the tube. In addition to the external coating on the tube, a quick visual inspection shows the vibrant purple-colored SilcoTek coating inside the narrow bore. 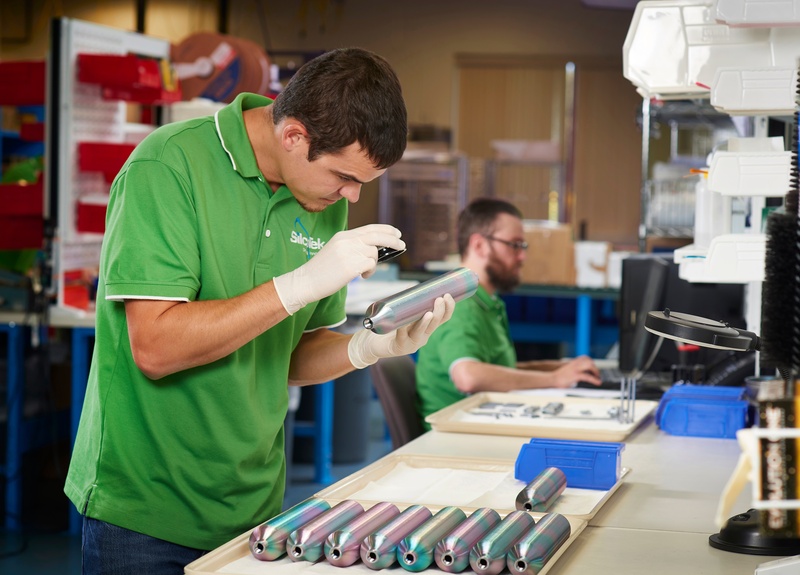 The thickness of the coating throughout the tube was verified by a Filmetrics F40-Series Thin Film Analyzer and confirmed to meet our specifications. SilcoTek coatings are not applied with line-of-sight processes like spraying that lead to inconsistent deposition and uncoated areas. With our process, 100% of your parts are coated, even if the design is complex or the pathways are tortuous. Once the coating process is complete, your Silco'd parts are unloaded and moved to the inspection area. Coating quality is initially verified by average surface contact angle measurements on a process control coupon. SilcoTek Technicians then visually inspect each part to ensure conformal thickness and proper aesthetics. Parts that pass inspection are issued a coating certification adherent to ISO 9001. After the parts have passed inspection, we package them so that they are secure and won't be damaged when traveling to the field, plant or back to the factory. Customer packaging is only re-used for return shipping upon request. 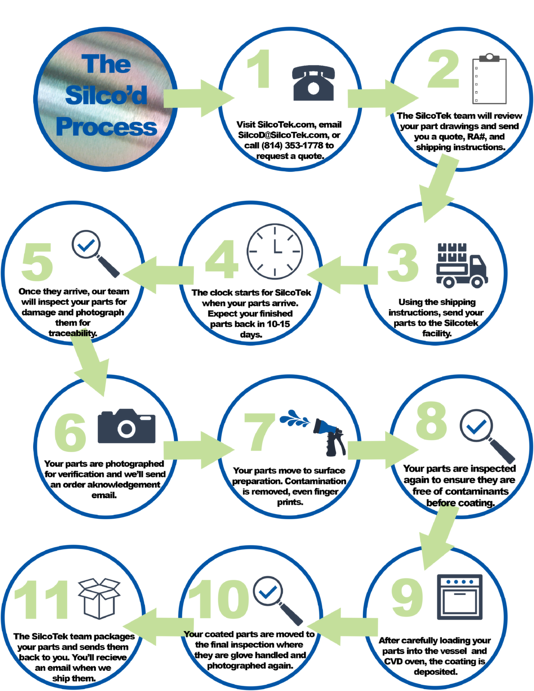 If, at receipt, incoming packaging is deemed inadequate for secure shipping, SilcoTek will use new packaging to ensure coated parts are returned safely. If shipping out of the United States, our international customer support specialist will work closely with you to arrange logistics efficiently. Once the parts are ready to go, we send you one last email to confirm that they are shipping by your preferred method. They're now coated, to spec, and ready to make what was impossible possible! 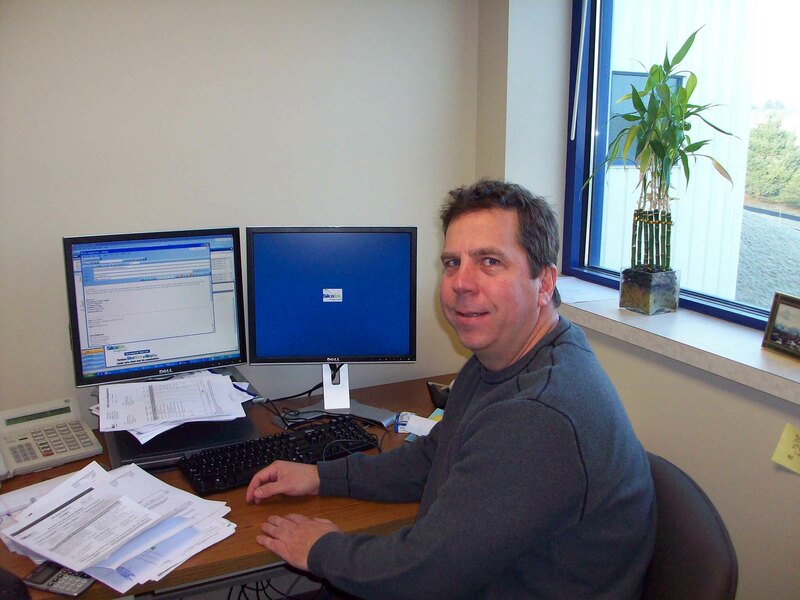 If you have any questions or would like a quote, email us at Silcod@SilcoTek.com or call +1 (814) 353-1778. Want to learn more?